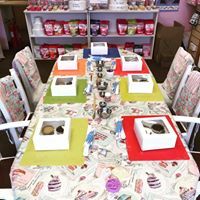 We hold a range of cake decorating classes, from beginners to cake makers wanting to learn new skills. Depending on the class and the level we will be working at each class will have its age range posted with it.we ask that under 16’s are accompanied by an adult. due to the size of our shop there will only be enough seating for people doing the class. Upcoming classes can be found on our Facebook page in the events section , they will also be posted on our blackboard in our shop. Prices will also be posted with the classes. private 1 on 1 classes can be booked, please message us for availability, private full cake classes start at £200. alternatively please go to our Facebook page to send us a message. we require at least 2 weeks notice for a cake order as all cakes are baked fresh. 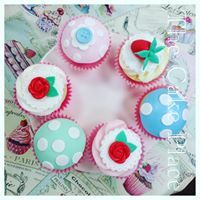 We are a Mother & Daughter team, together we create a whole range of cupcakes and cakes. We also stock a lovely range of cake decorating equipment, from boards and boxes, to fondant and cutters.